Tags- Clean And Clear Fairness Cream Review, Clean And Clear Fairness Cream price in India, Clean And Clear Fairness Cream buy online, Clean And Clear Fairness Cream for oily skin, Clean And Clear fairness moisturizer review, Clean And Clear Fairness Cream ingredients, Clean And Clear Fairness Cream advertisement, clean and clear fairness cream cost, India, Google, Yahoo, Google Images, Bing, United States of America. Claims- Clean & Clear Fairness Cream contains berries and Pure rice extracts that helps reduce skin pigmentation and other skin infections. It adds a glow to the skin, making it fairer and brighter. Clean & Clear Fairness Cream also protects the skin from harmful effects of UV sunrays. This oil-free formula doesn’t clog the skin pores, rather provides protection and fairness to it for a longer duration. This cream is non-greasy and non-sticky. This comes in a cute pinkish-purple tube which looks really chic. The packaging is sturdy but the nozzle packaging is a turn off for me because I can not control the amount I need for my face. It smells mildly floral and fades away really quick. The cream is slightly runny in consistency but nothing to worry about. It spreads really nicely onto the skin but yes, you need to blend it in nicely otherwise get ready to look like a ghost :P The cream is white (exactly white) in color and is really light on the skin. Now, this gets absorbed really quickly and makes the skin fair but nothing exceptional. It mattifies (meaning: makes the skin non-shiny) the skin for like 2-3 hours and after that, my skin becomes slightly oily. If you use a lot of it at one go, then it will surely leave a whitish caste on your skin. So, you need to take a proper amount and blend it in really really nicely so that you skin looks natural! But the 3X pinkish fairness claim is just not true. It is oil free but contains a lot of chemicals. It never ever broke my sensitive skin out. This cream is only for those with oily skin. At this price, I did not expect much out of it. This is a good face cream but not a good fairness cream at all. Overall verdict- If you have oily skin and have not found out a good face cream, then do try this one. However, I won't repurchase this because I love experimenting with different stuff! This won't live up-to your expectations if you are looking for a fairness cream. As an average face cream, this is good. It adds a glow and mattifies the skin too! 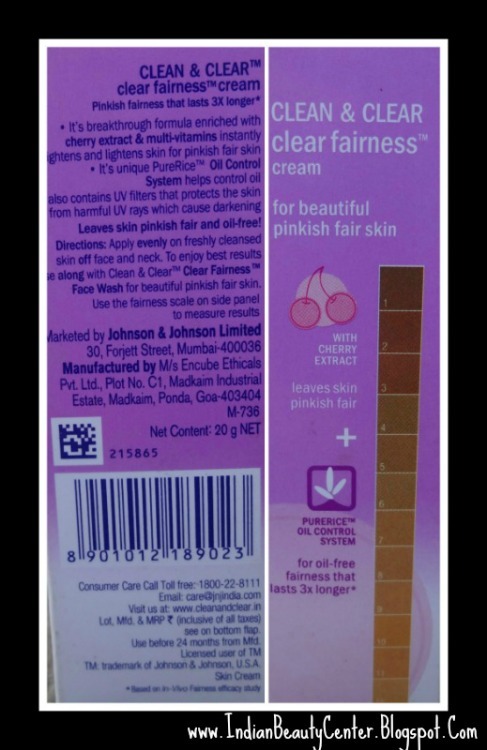 Have you tried the Clean and Clear Fairness cream? dear arpita, can u suggest any alternative to try for oily skin. Thanks for the great review but can you please tell me is it okay to use this cream in winter also ? can i use this cream after applying serum on my face ? Many creams contain harmful ingredients like mercury that may cause abdominal pain, increased thirst, constipation and other skin problems. In many instances, it may result in severe allergies.